Germany is taking part in the Eurovision Song Contest since the first contest ever in 1956. This year it’s going to be the 55th participation. In 1996 Germany has been disqualified in an international preliminary round, where the ESC was significantly held in Oslo! The enthusiasm for the “Grand Prix” can change from year to year; it all depends on the singer, the song and the general interest. Last year, the TV station has determined the song and singer, the German public has not been taken into the decision. If the country does not stand behind the singer is definitely not a good sign. From the bad experience last year, the German organizers have learned a lot. Additionally other concepts from different countries have been reviewed. The most important thing was to make this event to a really popular event. There were eight live shows where the TV spectators were able to choose the right singer, in the final show the possible songs were presented by two finalists. The favoured TV host Stefan Raab has been responsible for this show format. The show really got popular, especially among the younger generation. The whole country was talking about “Unser Star für Oslo” (Our star for Oslo), there were TV spots, adds in the magazines and newspapers. That’s probably the right formula to gain a broad audience. This year’s German representative is a sweet 18-years old girl name Lena from Hanover. Her previous performances in the pre decisions were outstanding and she was the clear favorite from the beginning thanks to her originality and positive charisma. With the chosen song “Satellite” she has already broken various records! The song immediately went number one in the German charts, and even in Austria and Switzerland. Furthermore Lena could enter the German charts with three songs in the top five! This has never happened in history before. The English bookmakers quote her to win the Eurovision Song Contest. The song “Satellite” has not been composed by Stefan Raab, but he is well known in the ESC due to his contributions in 1998, 2000 and 2004, his song failed in the final. The song is unusual and special, with Lena’s extraordinary presentation, her gamble with the camera and her inartificial attitude she really deserves a good position. Nobody could have imagined that this song is going to be so popular, is played on every radio station every day and even played in discos, Lena appears in all major TV shows. 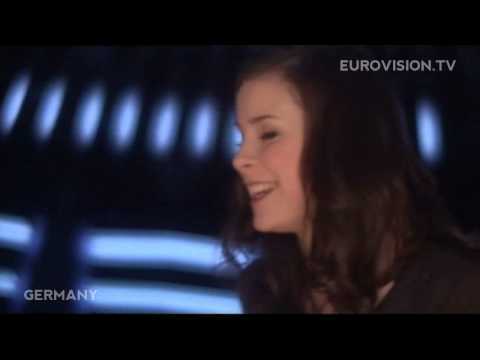 Germany has tried so hard to win the contest over these 54 years, once gained after “Ein bißchen Frieden” by Nicole in 1982. There were many second and third places; it should be time for Germany to win the contest again. If Germany does not win with this entry, it will never win again.